Greetings! I'm gonna upload some of my (unfinished) sprites to devianart. It may take between 1 and 3 years of work until I have finished all of this since I am doing this in my free time as a hobby. but you need to have a devianart account and login there to see images. 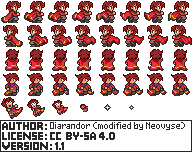 At present I have only uploaded a few sprite sheets, but I will keep uploading things from time to time. These sprites will probably be used for the game "Children of Solarus" of the Solarus Team. This was the first version for the sprite of my second character, the archer. (In my game she will be called Robyne Alabaster, and she will probably be a princess too, although I have not written that part of the plot yet.) The other missing sprite animations of this hero are still part of the work to do. This sprite could be used to replace princess Zelda sprites in the game "Children of Solarus" if Christopho and the Solarus team agree. I really like your little character Edgar, but I think he needs more chromatic unity. I mean not using too much bright colors, and too many colors. What do you think of my take on your character? Edit: I see I forgot the golden line on the coat in the second line, it should be there, it is a mistake! We should use the improved versions for our projects. Edit: yes, that yellow line is missing. But just symmetry of the right direction will do it. Another advice I could give, is that too much black lines (black pixels) is not good. For example, the hair, if it is blond or brown, can be draw with a line a bit darker around, but not black, to "lighten" the drawing visually. @Neovyse: I guess that another of the good things is that the new (and cooler) version of the hero is very close to your drawing (isn't it? ), so all will fit perfectly now). Should I modify all the other animations with your style? or will be you who does it? I see you found my inspiration source for the colors (my own drawing) ! I will draw the sprite of the deer someday. Our hero may need it. That is excellent work. Neovyse and Diarandor got skill! I made the second one today. They may be a bit repetitive, so I may improve them someday. The castle theme sounds phenomenal how long did it take you to put together?